Currently, common elands are not endangered. They are conserved by the U.S. Endangered Species Act, and regulated in international trade by the Convention on International Trade in Endangered Species. Using ground counts and aerial surveys, the International Union for Conservation of Nature (IUCN) calculates the population density of the common eland to be between 0.05 and 1 per square kilometre with a total population estimate of 136,000. Populations are considered stable or increasing in the countries of Namibia, Botswana, Zimbabwe, South Africa, Malawi and possibly Tanzania. The population is, however, gradually decreasing due to habitat loss, caused by expanding human settlements and poaching for its superior meat. As they are docile and inactive most of the time, they can easily be killed. The species became extinct in Swaziland and Zimbabwe, but has been reintroduced. The IUCN states that about half of the estimated total population lives in protected areas and 30% on private land. Protected areas that support major populations include Omo (Ethiopia), Serengeti, Katavi, Ruaha and Selous-Kilombero (Tanzania), Kafue and North Luangwa (Zambia), Nyika (Malawi), Etosha (Namibia), Kgalagadi Transfrontier Park (Botswana/South Africa) and Ukhahlamba Drakensberg Park (South Africa). Most of these populations appear to be stable. 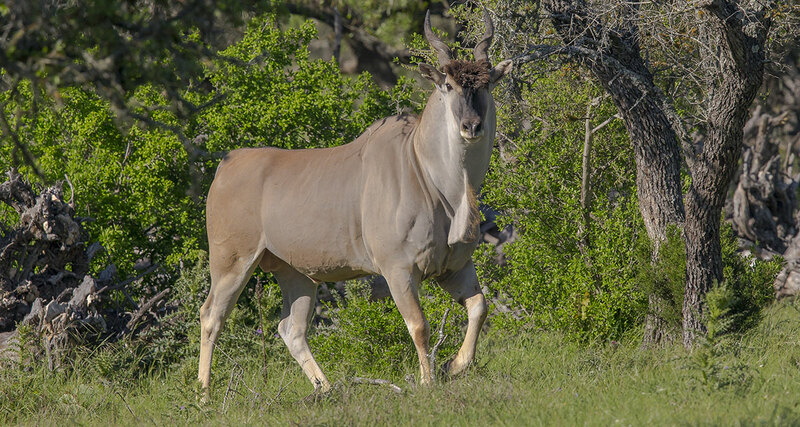 Relatively large numbers of common eland now live on private land, particularly in Namibia, Zimbabwe and South Africa, reflecting its value as a trophy animal. Common elands have also been widely domesticated in Zimbabwe, South Africa and Kenya, as well as in Russia, Ukraine and England.